This essay forges an inner link between the ‘The New Gnosis’ articulated in the SETH books of Jane Roberts (in particular the notion of ‘mental enclosures’ and ‘consciousness units’ presented in The Early Sessions Vol. 3 and The Unknown Reality Vol. 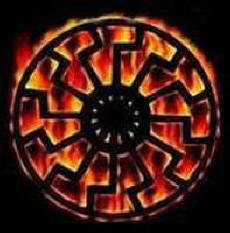 1) and the most ancient symbol of traditional Occultism and ‘Occult Science’ – ‘The Black Sun’. "Blindness is the world's true essence, and not knowledge prompts its movements, but merely a headlong impulse, a blind impetus of unique weight and violence, which procures itself just so much light and knowledge as will suffice to still the pressing need experienced at the moment"
Before considering the nature of any ‘occult’ powers, let alone any ultimate ‘Occult Power within All That Is’ we must first of all ask ourselves what ‘power’ itself essentially is. More than that, we must come to inwardly know power directly. Knowledge is a source of power. But there is outer knowledge and inner knowledge – gnosis. Similarly, there is outer power and inner power. Outer knowledge is knowledge about things and about other beings. Outer power is power over things and over other beings. Outer power is a poor substitute for inner power. In this sense it is not power that corrupts but impotence – lack of inner power. Similarly, it is not knowledge that corrupts but ignorance. Inner knowing is itself power in the purest sense, potent because it is a knowing awareness of a hidden or ‘occult’ realm – the dark realm of pure potentiality that is the very essence of ‘potency’ or ‘power’ as potentia and the creative source of all actual things and beings. Inner power is the power to create that derives from this source, released through inner knowing or gnosis. Those who fear ‘occult’ knowledge and ‘occult’ power do so because they fear inner knowledge and inner power. Those who seek occult knowledge and power however, are often all-too-easily seduced into satisfaction with mere symbols of such knowledge and power. As a result they invest their own inner knowing and project their own inner power into such symbols – whether a nation and its wise leader, or a religion and its wise prophet or saviour. Those who have amassed outer knowledge or outer power over others – religious or political - easily serve as symbols of inner knowledge and inner power for those that seek it. They invite the investment or projection of inner power or inner knowledge into them, and then translate them into outer power – power over others - and outer knowledge. The latter can just as easily take the form of distorted outward expressions of direct inner knowing as of superficial knowledge ‘about’. It was not always so and will not remain so. The earliest men and women did not tremble in fear before the power of nature, and then create gods to protect themselves against it. Nor did they invent forms of knowledge to ‘control’ the power of nature – in other words to exert power over it. Instead they fully identified with the power of nature, creative and destructive. In this way they were able to feel the power of their own inner nature. ‘Happiness is the feeling of power’ (Nietzsche). To the extent that they were able to identify with the power of nature, and feel it as their own, they were indeed truly happy, as well as truly powerful and wise – knowing the power of nature from within. Only later did religions arise whose gods stood as symbols of a power that could be exerted over nature and human beings. It was such religions that gave rise to those modes of knowledge that we identify today with ‘science’ – a type of knowledge whose seemingly self-evident and technological power over nature and over human beings does not require one grain of true inner knowledge or inner power to exercise. It requires not one grain of inner knowledge or inner power to design and wield the most sophisticated technological weapon.